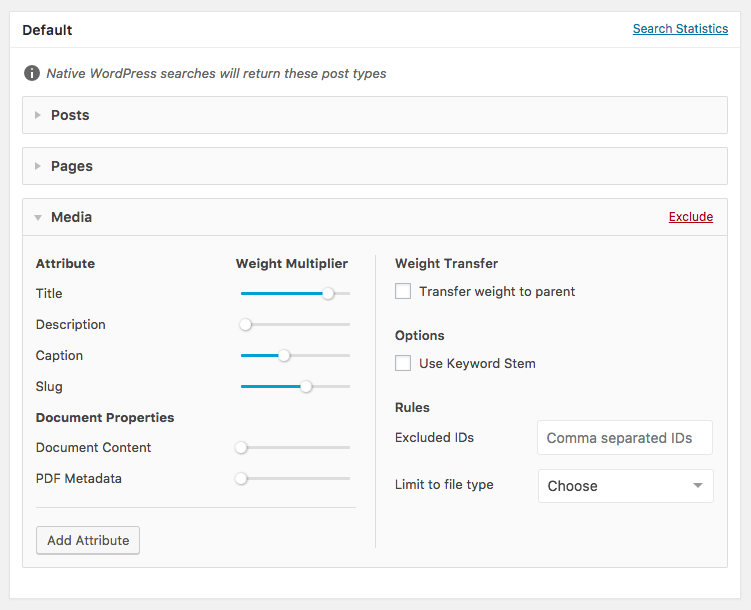 The primary purpose of the SearchWP settings screen is to allow modification of the weights used within SearchWP’s algorithm. Each search engine has its own settings. 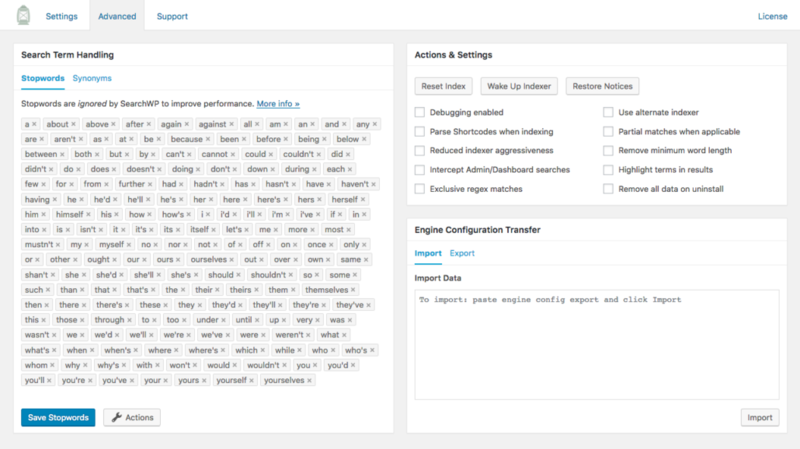 The Default engine replaces all WordPress native searches. Each Supplemental Engine has the same settings as the default engine, but also allows you to name it. A code-friendly version of your name is provided alongside the engine name, and that’s what you will use in your code. Engines are primarily based on post types. You can add/exclude any available post type to any engine at any time. If a post type is listed in the configuration, it will be included in searches. All of the registered (and not excluded from search) post types are available for each SearchWP engine configuration. Media is somewhat unique, however. Note that Document content and PDF metadata each have their own Weight fields which apply only to documents SearchWP was able to parse and index. The parent attribution feature for Media in SearchWP can be very helpful. By default, SearchWP will return Media results just like any post type. The link will direct you to the Attachment page for that Media (which can be customized to link directly to the file if you’d like) but that’s not always desirable. With Transfer weight to parent enabled, SearchWP will instead return the parent post for Media search results. For example, if you have a Page on your site, and you’ve uploaded a PDF to that Page while editing that Page (i.e. WordPress lists that PDF as Uploaded to that Page) searches for content within that PDF will return the parent Page as the result instead of the PDF itself. Keyword stemming is an active process based on the language of the term itself. Terms are checked for a suffix (e.g. “ing”, “ed”, etc.) and the base of the word is determined and used as a proper stem. For a detailed explanation of keyword stemming please see this Wikipedia article. Tick this checkbox to enable this sort of behavior when performing searches. 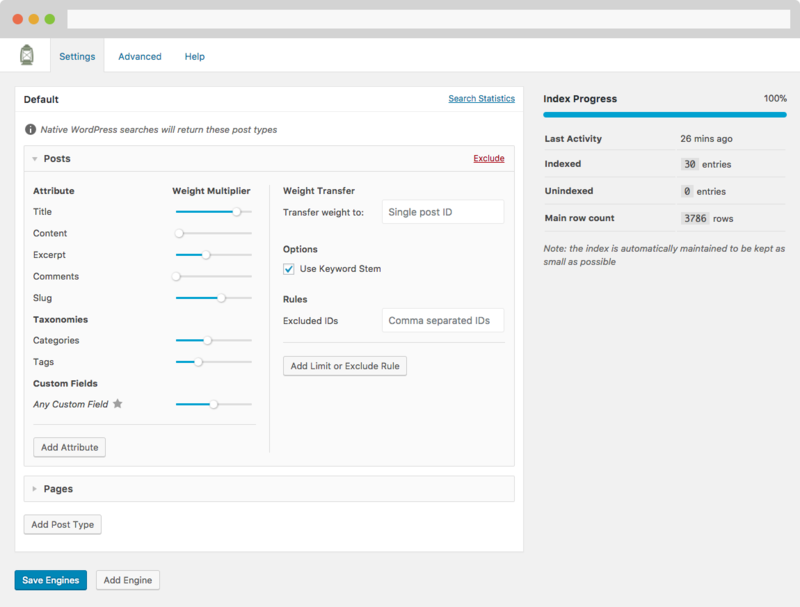 The Advanced tab of the SearchWP settings screen allows you to take some common actions that may prove to be useful from time to time. Read more. For more information please see the Advanced settings screen documentation. You can use the Support tab of the SearchWP settings screen to open a support ticket. An active license is required to open a support ticket. Please begin by using a few words to describe your issue, which will guide you through the SearchWP documentation search. If the documentation does not help, you’ll be able to create a ticket right there. 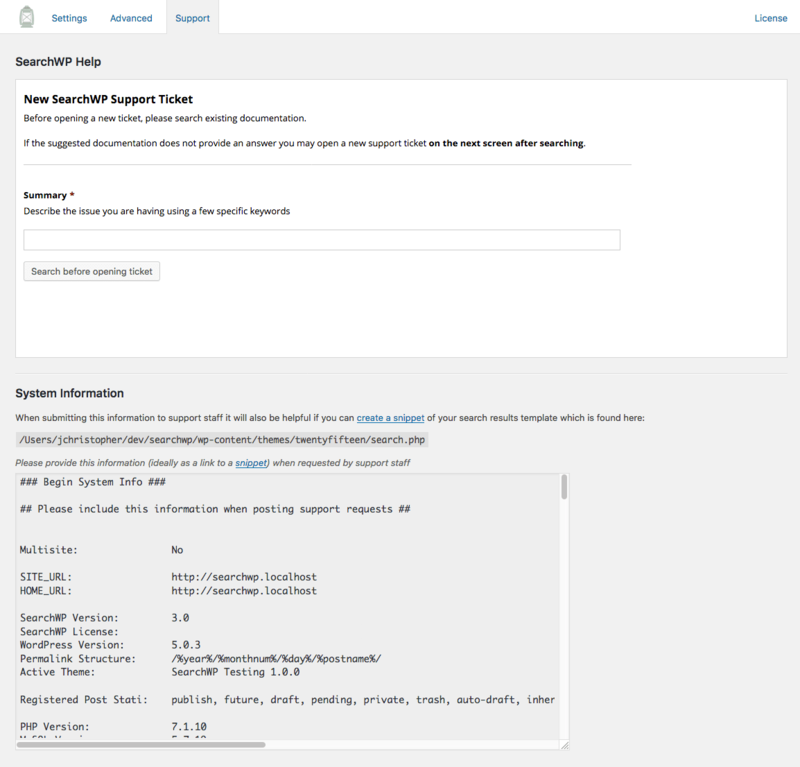 Below that is your System Information, which includes some details about your server and WordPress install, along with your SearchWP engine settings. This can sometimes be useful when troubleshooting a support ticket, so please be prepared to provide a copy upon request from SearchWP support. Fix Search on Your Site. No Coding Required!